Heartbeat Photography: Backup protection for your photographs! Backup protection for your photographs! Have you ever wondered what happens to your photos after I burn them to your CD? Do I delete them? Save them on a CD of my own? Do I have them all on my computer? Many photographers will actually delete the photos after burning the CD, but to me, that was complete crazyness! So when I first started, I would burn myself a copy of the CD and store that in a CD filing system. As I got more and more sessions, the CD storage got fuller and fuller and I began wondering what I was going to do with all these Cds! What am I going to do, when four years have gone by, and I have hundreds of CD's? Keep them all? So I began researching other ways of storage. It was then that I learned about CD's. . . Did you know that cd's can deteriorate after time (usually about 20 years) and the data on them will be gone. This is especially if you have them in sunlight or other conditions that would age them. Also -- that writing on them in permanent marker can ruin them? The acid will seep through to the storage part of the disc and ruin the parts that it touches. Do you know how many CD's I have written on and sent home to clients? I also learned about external hard drives. How you can store hundreds of GB on one and keep it connected to your computer. I thought about purchasing one, but ended up waiting. It was within a month that a virus attacked our computer and took over our hard drive..... I was in tears not knowing if I would see all of our pictures again. We took our computer in and paid a pretty penny to save all of our photos and documents, and get them put onto an external hard drive. I was SO thankful. Since then we have purchased another external hard drive, as our first is full. I am keeping all of my clients photos on our personal storage items, and it is taking up a ton of space, and I was beginning to wonder again what I should do. Then I heard about a photographers computer drive failing, and others who have dropped their external hard drive and all the storage on it was gone -- never to be seen again. You know that icky feeling in your stomach you get when you think of something horrible happening?? That is exactly what I felt. What if all of the photos on my hard drive where gone instantly because I tripped? Or because my two year old decided a hard drive should be thrown across the room.. you know, just to see what would happen? (what a wonderful age of discovery! haha). Well, I'm happy to say, that I have found a wonderful solution. Online storage backup. I get unlimited online storage -- if my house burns down, computer is stolen, or hard drive is chucked across the room, all of my photos and documents can be restored with one click! I want to put all of my client's photos into my online storage as well. What happens if your CD gets lost or broken? Or your computer crashes? Maybe you have an online backup service already -- or maybe you don't. Would you like to save all of your photos from your photography sessions online to be protected? A NEW ADD ON that I am offering with every session, is online backup of that session. You can feel secure in that all of your photos will be saved online after every session. If you lose/break your CD, you can ask me for another one and I can send it to you! I've already had clients message me, very worried, because something happened to their CD's. They were SO relieved to hear that I had saved their photos for them. 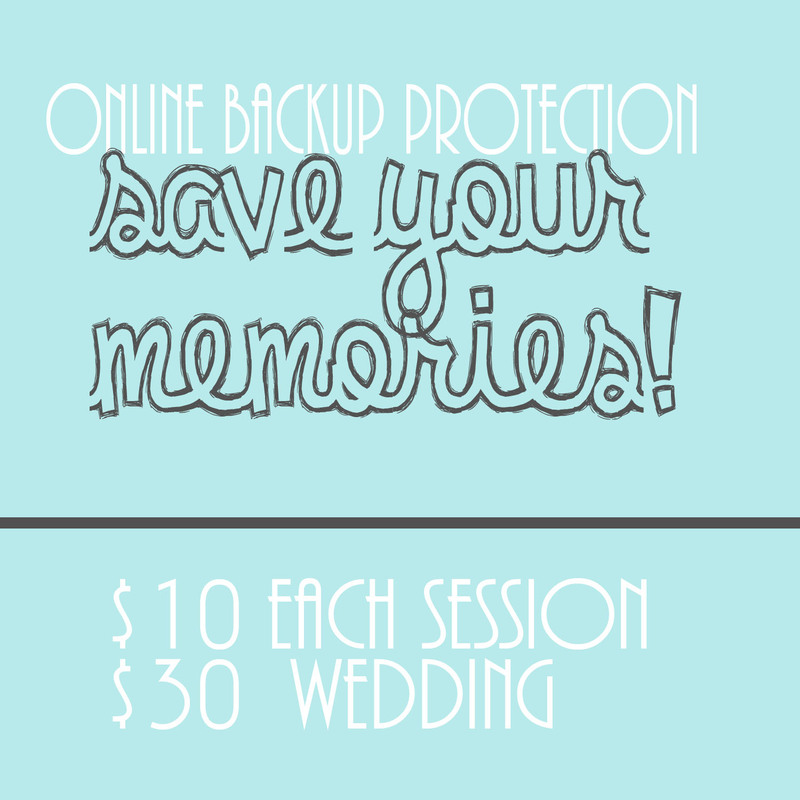 So now when you order a session, you will see the Online Backup option!! 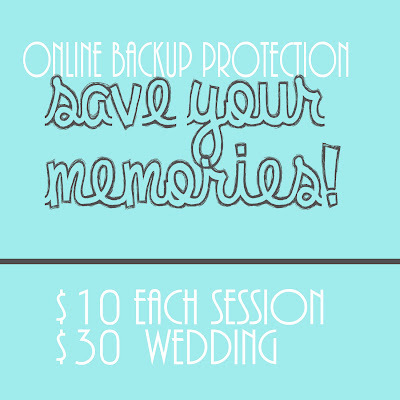 It is only $10 per session, and $30 for wedding backup! Awesomeness, huh? Already had a session with me? You can still back it up! Just go to the website: www.ourheartsbeating.com Go to: Details Then; Make your Deposit!